The new Fortnite challenges are here and this week you’ll need to follow the treasure map found in Tomato Town. There are only a couple of days left to tick off this challenge before the start of Fortnite Season 5. This is part of Season 4’s Week 1 Fortnite challenges, where you can earn extra Battle Stars and XP for your trouble. You will only be able to take part if you have a Battle Pass, of course. For completing the challenge “Follow the treasure map found in Tomato Town“, you get 10 stars. And when you complete four of the seven challenges, you earn 4,000 XP. Where is the Tomato Town Treasure Map? 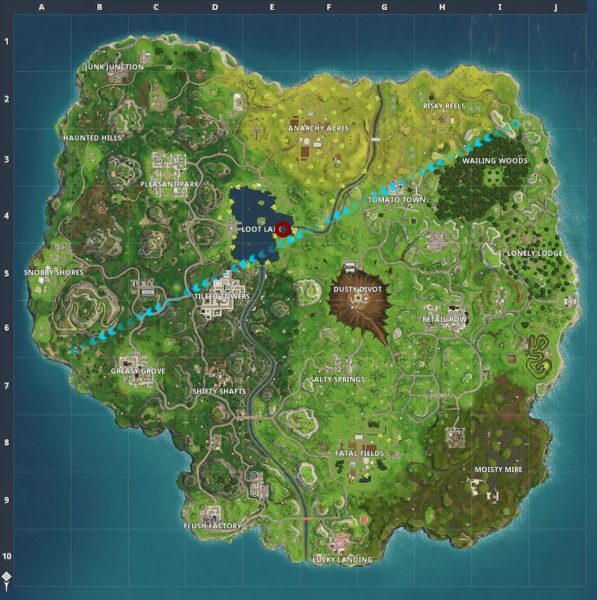 Have a scour around Tomato Town to track down the map itself if you want to do the challenge the proper way. Saying that, you could just follow our guide to go straight for the treasure. As you can see, it’s located at E4. As always, you have to complete the match to complete the challenge – you can’t just find the star then quit out immediately. No doubt someone will snipe you as soon as you grab it anyway. Check out the Fortnite Season 4 patch notes for the lowdown on all the changes. You can check out the new new superhero Fortnite skins and also figure how you’re going to reach tier 100 and bag that sweet new Omega skin. Did you know there’s also a secret free Battle Pass tier found at the prison? You might want to get on that.